So lots to do, but the first stage is just to assemble the core hardware and see if I can get it to play nicely together. This is really a major part for me; if it’s can’t make noise – or a loud enough noise to wake me – then I’m never going to get up for work! I wanted something nice and easy to fit together that could output to speakers. 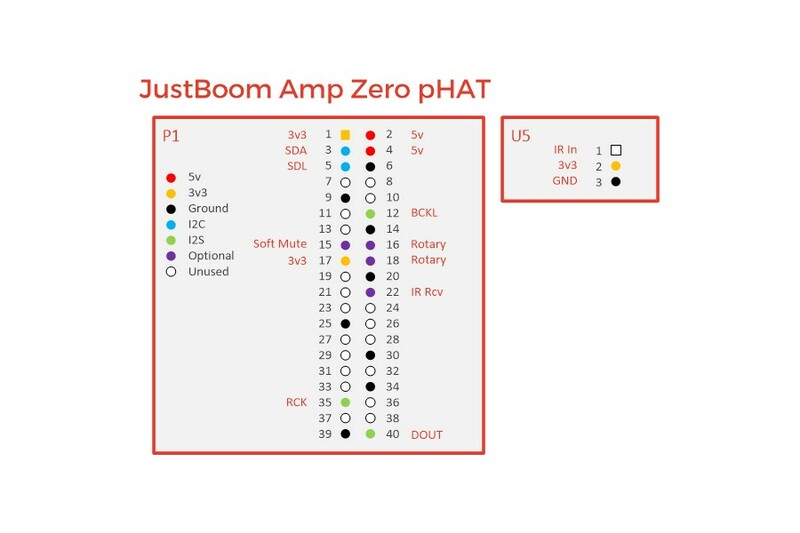 For that I chose the JustBoom Amp Zero pHAT, purchased from Pi Supply. For these I just ripper a couple out of an old, knackered monitor that was destined for waste recycling. They’re small 8Ω/2W speakers but would really do the trick because they’re not physically very large, so perfect for the clock radio, and they were free – perfect for my wallet. I wanted to stack my Pi Zero, Amp and 5″ screen, but the standard headers you tend to get with the Pi only allow for one card. 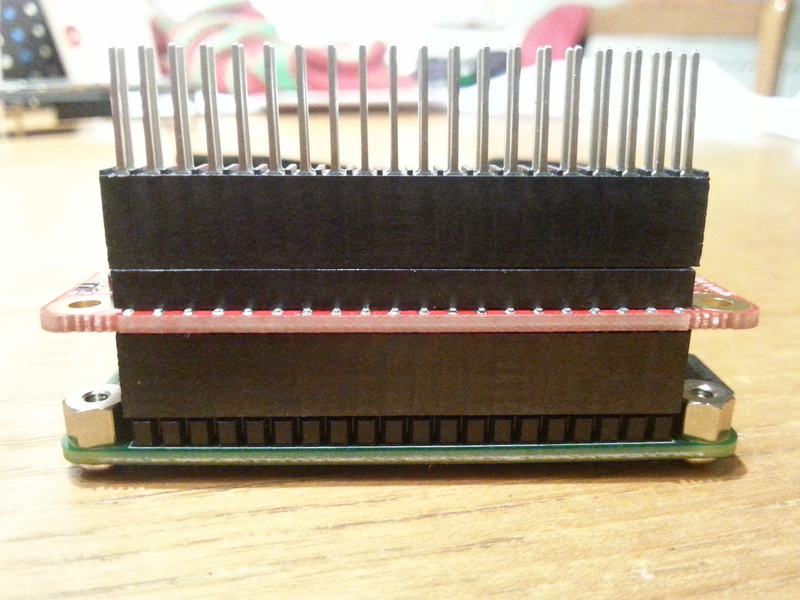 So I bought a couple each of the 14.83mm and 10mm 2×20 stacking headers from Toby Electronics. I’d love to say I have a 3D printer I can create a case with, or some really nice retro something-or-other that will serve well, but I don’t. I’ll probably end up making it out of some blocks/scraps of wood. There is a lot of media playing software out there which can be used with the amp; OSMC, Roon, Volumio, Moode, to name just a few. But whereas these would be great for playing media, these aren’t clock radios and wouldn’t offer me the kind of thing I want to do. So instead I am starting with a stock install of Raspbian Jessie and will attempt (sometime in the future) to build the interface myself. Not sure yet what I will need to use or be created. Chances are that the interface I will attempt to do myself (most likely to be web based, so probably a combination of Chromium in kiosk mode, nodejs, etc.) but then other parts will be standard software. For example, playing mp3s from the command line is quite easy with mpg321. I’m not going to detail how you set up Raspbian on your sdcard – there are dozens of tutorials on how to do that. The only thing I will note is that getting everything working on the Pi Zero was far easier when having a Pi 2 (or, I guess, 3) hanging around. As you are no doubt aware, the Pi Zero is somewhat lacking on ports (what do you expect from a £4 machine!) so getting the wifi dongle set up, ssh and so on isn’t too easy unless you have a usb hub (which I didn’t). But because the Zero and Pi 2 are basically the same setup you can easily interchange sdcards. So I set everything up on my Pi 2, where I could plug in my wifi dongle, keyboard, output to a regular monitor and so on very easily because the ports are are there. Then when I put the sdcard back into the Pi Zero I knew I would be able to ssh or vnc into the machine and only then needed to plugin in the wifi dongle to the Pi Zero. If, like me, you find yourself needing to take the boards apart and taking the headers off then be careful! 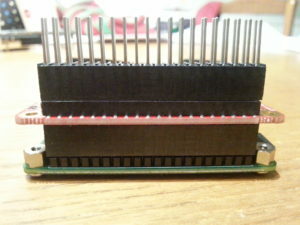 The ones from Toby Electronics are well made with some very tight tolerances and I actually bent a couple of my header pins on the pi taking the stacking header off, so just watch out! Almost everything you need to use the amp is already on Jessie. 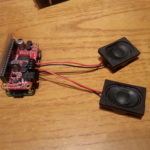 Because JustBoom have made their amp a fully compliant HAT board, it more or less is just a matter of plug and play – though you have to do a small config.txt file change. but you may like to use emacs, vim, or some graphical editor. Whatever floats your text editing boat. Then it’s a matter of enabling the HAT board. This is done with using an overlay command in the config.txt file. Overlays are basically ways to describe add-on boards so that the system is aware of them and can add that information to the device tree. 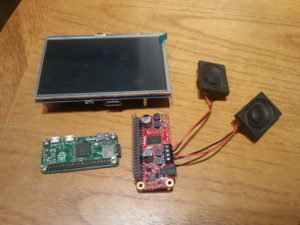 (You can read all about device trees and overlays on the Raspberry Pi website.) Thankfully Jessie already comes with a couple overlays for the JustBoom devices, one for their DACs (Digital to Analogue Converters) and what we’ll be using for the amp, and one for their digital devices. Now the fun part – seeing if it all worked! At this point I gave the system a reboot and once back in I needed to make sure that the speakers could output some audio. For this I used the built-in speaker-test command. The -c 2 is for the number of channels. Without supplying this I got no audio and an error message from speaker-test. But on a successful test I was able to hear a static sound for a second or two from one speaker and then the other, and back and forth it went. it changes the type of output to a wav audio file. On running that command I heard “Front left” from the left speaker and “Front right” from the right speaker. Success! 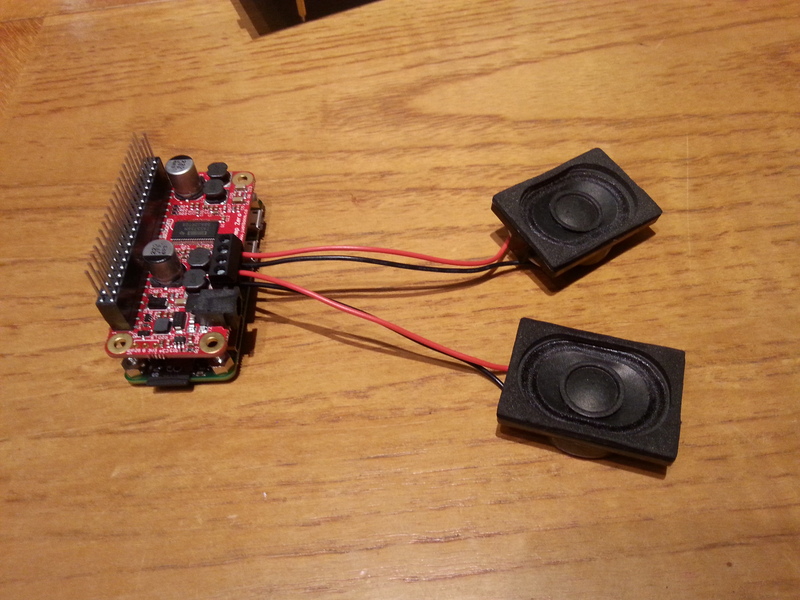 I have audio output! The first thing I tried to use to play an mp3 was aplay but it did not go well at all! It turns out that aplay doesn’t support alsa audio devices which is just what the JustBoom Zero Amp pHAT device happens to be. And there you have it – mp3 playing easily and clearly on the Pi Zero. So that sounds very promising. I also want to try out omxplayer to see if I will use that over mpg321. Of course, if the interface ends up being web-based then I’ll probably end up using the built-in browser players. Step two will be a brief overview of the screen… when I get around to writing it, that is!